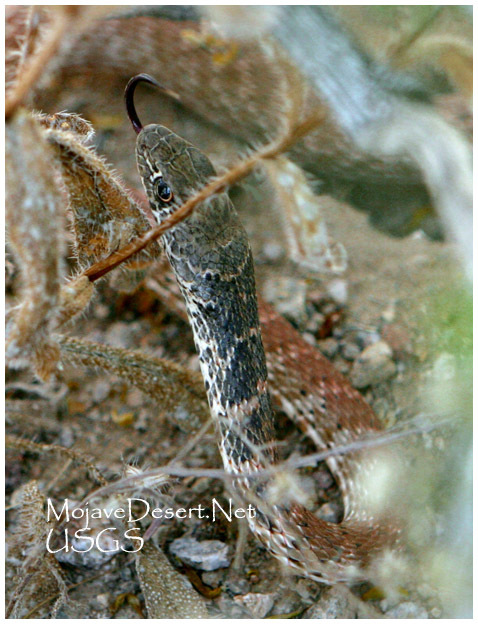 This is the most commonly viewed snake within Mojave Desert. It can be seen on many of the roads sunning itself in the early to late morning hours. It is the fastest snake in the desert moving at up to 7mph and can reach up to 6 feet long with a slender, whiplike body. Coloration may vary from gray and tan to pink with black crossbars always present on the neck. A the snake gets older it begins to take on a more distinct reddish appearance. It’s diet consist of lizards, small snakes, mice and birds. It is very mean tempered and should not be handled. Although not poisonous its bite can tear the flesh and should be avoided.